Sandra Bland was not perfect. Thank God. With his finger inches from my face, it felt for a moment as if Twitter had taken on human form in the middle of Prairie View City Hall to unleash all its vitriol. That is what Sandra Bland’s friends have been enduring for months as they refuse to be silent and refuse to let Sandy be silenced. Having gotten off a plane that morning from Sandra Bland’s Chicago, that he claimed to know so much about, I focused deeply in prayer to maintain my composure. I closed my eyes and saw the faces I had just left: the faces of Sandra Bland’s mother, sisters, brother, nieces and nephews; the faces of a family just as transparent about their strengths and questions and convictions and love for one another as Sandra Bland had shown herself to be. I knew that my name was coming up after one more person, slotted to speak after the two most vocal opponents of the recently renamed Sandra Bland Parkway. Laying aside for the moment the fact that Sandra Bland was 2 years old in the year 1989 that he claimed to have researched, the richness of personality and passion that Sandra Bland brought to the world and the extravagantly loving manner in which her family journeyed through life together still had me reeling. I have been accused on more than one occasion of portraying Sandra Bland in just as narrow and unrealistic a manner as this man: as a saint rather than a sinner. To see her as one or the other, however, would be to completely miss the point both factually and theologically. Like every person in that room had the capacity to be, Sandra Bland was both. For “all fall short” but at the same time all who seize God’s love are “forever made perfect” through it. What made her compelling for so many in my generation was not that she was a saint. My generation has grown up respecting sincerity and authenticity far above the value we place on the perfection we do not see as realistic and the self-righteousness we have experienced as hurtful. Instead, she grasped the hearts of many with the boldness, sincerity and vulnerability with which she shared herself; the urgency with which she expressed love and concern for others and their well-being and personal growth; and the commitment she had to taking action to make the world better even if she had to take action alone. Through her #SandySpeaks videos there remained a constant refrain: she wanted people to know that they were loved and valuable. To be told you are loved and to be told you are valued, not only by a human being, but also, as Sandra Bland said, by God, is perhaps the deepest longing of the human soul. It is understandable, as reporters in the room were quick to note, that there was a generational divide in the room. The older members of the Prairie View community had been assembled with City Councilwoman Paulette Barnett to oppose Sandra Bland Parkway in what would ultimately turn out to be an utter failure of a reversal when the City Council voted 4-1 to keep it Sandra Bland Parkway. Their ignorance of Sandra Bland’s impact was understandable because they did not know Sandra as many of her young adults friends did; neither were they likely to have gotten to know her by having explored her #SandySpeaks videos. Yet, neither generational difference, nor lack of technological access, nor lack of personal connection could ever justify the lack of compassion with which they spoke about a person, a child of God – yes, a young woman whose impact has transcended borders and languages – but more importantly, a child of God whose freedom, rights and life would come up equal on God’s balances to both the Mayor of Prairie View and the current occupants of the Waller County Jail. We can never allow frustration to extinguish our ability to clasp onto one another’s humanity and hold it as if it was sacred – because it is. As for me personally, do I think Sandra Bland was a saint? Of course not, no one has ever claimed that. It is not necessary for her to be a saint in order to honor her, respect her, and be impacted and changed by her witness. Pumpin in my living room. It is easy to celebrate her if you understand that all the things that people criticize about her in the last moments we see her speaking are exactly what the world needs in order to become a better place: an unapologetic black woman who loves herself, knows her rights, and is not willing to bend the knee to injustice. The fact that that unbending knee was knocked out from under her is more painful than can be bourn for those who understand its importance. The fact that that unbowing head was slammed to the ground is enough fuel to fire the call for justice for years to come. The fact that that unapologetic voice seemed to be silenced, only causes the sound of her voice to travel further across the planet. I thank God that Sandra Bland did not have to be perfect in order to impact the world. It gives me hope that maybe you and I can make a difference too. “Isn’t that what you are here for?! ?” the white, female ABC reporter in front of us raged. She had watched from her SUV as those of us keeping vigil for Sandy Bland outside of Waller County Jail watched the video of Sandy’s arrest for the first time, huddled around one of our smart phones. It was a disturbing video; traumatic; infuriating; and we were visibly upset. The majority of those sitting in front of the County Jail were African American women close to Sandy’s age, similarly outspoken, and committed to the same ideals of justice that she was so vocal about in her #SandySpeaks videos. Over the course of the past seven days that we have sat in front of the scene of Sandy’s death, they have made it very clear: Sandy could have been any one of them. “What, don’t you want your message to get out? Isn’t that what you are here for?!? !” she raged. My next words were clear: “I won’t be doing an interview with you,” I said as we all walked away and she continued to rage. I was shaking. I was shaking because it was not the first time that week she had treated us that way. I was shaking because in that moment she was giving embodiment to the very things we were fighting against: white indifference to the suffering of African Americans; the expectation and insistence of white people that our own comfort, feelings, and agendas will be prioritized over those of people of color even in moments that most impact people of color; and the inability to mourn the death of African Americans, compounded with the unwillingness to allow African Americans space to mourn without analysis. White supremacy is not usually a man in a white hood; in fact, it hardly ever is. It is the way that we, as white people, daily occupy space in this country in a manner that demands and expects our needs, wants, comfort and feelings will be prioritized. The dangerous implications of that reality are what we see playing out in the dashcam footage released on Tuesday: a man with authority becoming enraged that his feelings, comfort, and pride are not prioritized over the rights, safety and life of an African American woman. The dynamic is all too similar to the arrangement upon which our nation was built: that black lives are less important than white comfort. That was what was taught by philosophers and theologians, and then spoon-fed to congregations by white pastors like myself who promoted a system of “Christian slave-holding” – a contradiction if there ever was one. Now many white people are feeling the discomfort as we try to right the ship midstream. Our discomfort is necessary to right the scales on which their lives have been undervalued for so long. First, we are not sitting outside the Waller County Jail for the sake of the media. We are sitting out there for Sandra Bland. We are sitting out there because, as her mother said last night at the Memorial Service on the campus of Prairie View University, Sandy knew she had a purpose here in Texas. As her mother quoted her, “My purpose is to go back to Texas, my purpose is to stop all social injustice in the South.” That calling was so evident in her videos. Which is why, as we sat overwhelmed with the tragedy of her death a week ago, listening to the words of one of her #SandySpeaks videos, we could not ignore her call for assistance: “I need your help. I cannot do this alone.” We knew what we had to do. We had to go to the spot where her life had been taken and give her honor, sitting vigil for our sister in Christ so that the world will know that #SandySTILLSpeaks and cannot be silenced. Second, what I see in this video is a woman fighting for her life from the minute she is pulled over. Fighting to live in a country in which she had rights, and in which her humanity was respected. Fighting to live in a place where you are able to assert your legal rights regardless of the color of your skin, and you do not have to genuflect to authority when that authority is misused and abused in order to save your own skin. In doing so, Sandra Bland was not just fighting for her own life, she was fighting for all of our lives. Fighting back against a system that says you have to treat police with respect even if they do not treat you with respect. Fighting against a system where the wounded male ego is cause for arrest. Fighting against a system where the voices of women are silenced, and the bodies of women are grasped without their permission. On Monday, July 20, a week after Sandy’s death, District Attorney Elton Mathis said, “It was not a model person who was stopped.” To say I disagree could never be enough. So I will continue to sit outside the Waller County Jail in vigil to let the community know that here was lost a life that deserves to be honored. I will continue to listen to #SandySpeaks and encourage you to do likewise. I am confident that Sandra Bland did not kill herself. I have been confident from the second I heard her voice: the voice of a woman who unapologetically loved herself, others, and her God. That can be a difficult thing to be, however, when you live in a world that expects women like Sandy to apologize for their own greatness. “Blow that out,” the voice came loud and stern over the loud speakers of the Waller County Sheriff’s Office and County Jail. 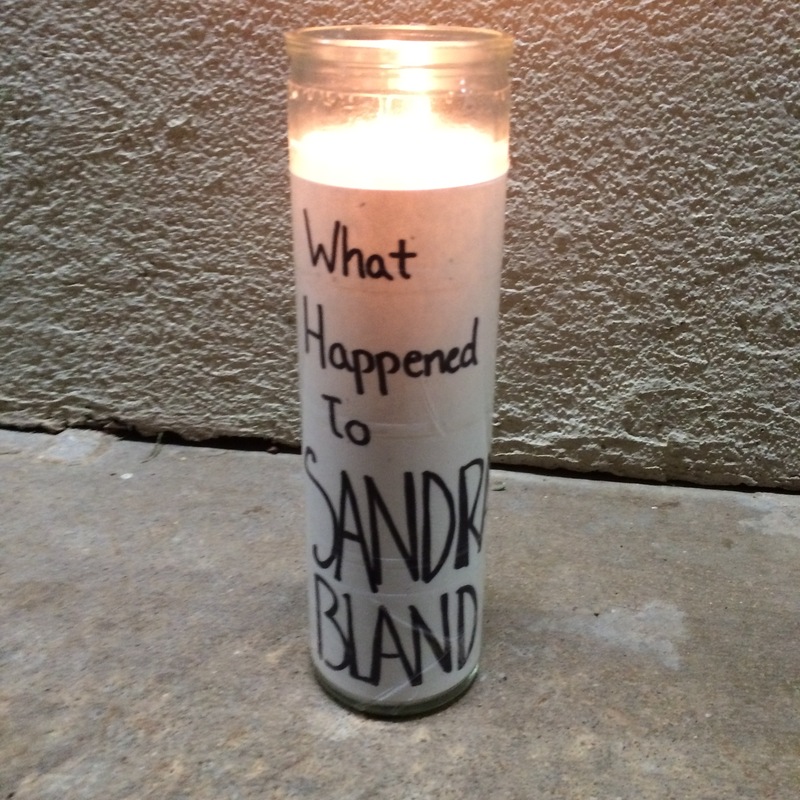 Moments earlier, we had lit a votive candle on the front stoop of the building with the words, “What happened to Sandra Bland?” written on the side. As I picked up the match stubs, not wanting to give anyone cause for a litter fine, and turned back to rejoin my fellow travelers, a woman leaving her car passed me on her way to the front door. “Can I help you with something?” she had asked politely. “We are just here to pray,” I had replied, squinting in the darkness to try to see her face as she walked from her car. It was dark on that street, everywhere except the lights of the Sheriff’s Office. Pitch dark. We passed one another, and as she reached the front door, she read the sign on the candle, and then continued on to open the door and walk inside. “Blow that out,” came an angry voice addressing her over the speakers that we could not see on the side of the County Jail. I spun around from the friends I was begin to pray with, and watched as the woman bent her body completely into a V, lifting one leg slightly off the ground as she balanced with her hand on the front door of the County Jail, and *puff* the candle was out. I picked the unused matches back up off of the car seat where I had dropped them and slipped them into my pocket. We had known that we must be being watched. We had pulled off the main road into the neighborhood where the Sheriff’s Office lay, just a few minutes after the Texas Rangers and their vehicles had pulled out for the night. I didn’t know Sandra Bland, but I knew people who did; I loved people who did; I share life with people who did. She sounds like an amazing woman from their reports, but the truth of the matter is that Sandra does not need anyone to say who she was: she speaks for herself. The internet is full of her videos of inspiring and convicting messages. It turned my stomach to see the video of her explaining the importance of #BlackLivesMatter to those who use the language of #AllLivesMatter – and to know that her name is now being hashtagged as well. But she is more than a hashtag, and #BlackLivesMatter could not come close to strong enough words for what we were feeling. Even while she believed so strongly in the power of social media: She is more than a hashtag. We are all more than a hashtag. She deserves more than our fingers typing. She deserves our lips to say her name. Our hearts to beat her name. Our feet to march her name. We decided we would take one of the votive candles we had lit for Charleston, and light one tall, lone, strong candle for Sandra in the last place she had been: Waller County. Our friend Nina joined us and read evening prayers from the Book of Common Prayer in the backseat as Rhys and I prepared ourselves, driving past the college where both Rhys and Sandra had attended: Prairie View A&M. Rhys took anointing oil from his backpack and reached across the front seat to place it on my forehead as I drove. 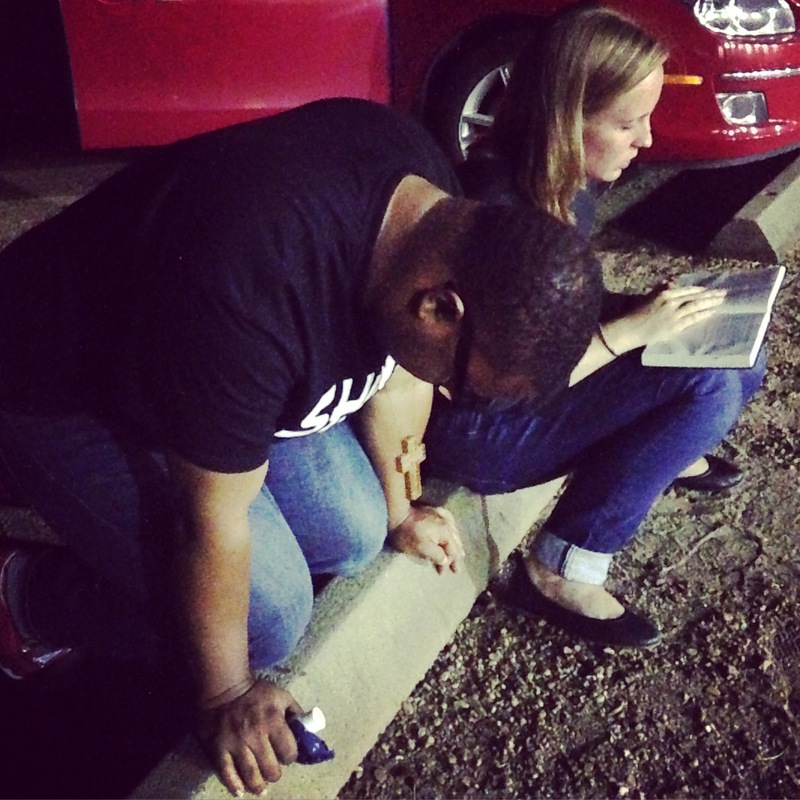 It was that same anointing oil that Rhys held in his hand as we finished praying in front of the County Jail. He stood up and began to walk away from the safety of our circle and boldly towards the stoop of the County Jail. I followed him with the matches in my hand. Rhys knelt and began to pray as he anointed the stoop with oil. Praying for truth and justice to be served. I walked towards the candle.